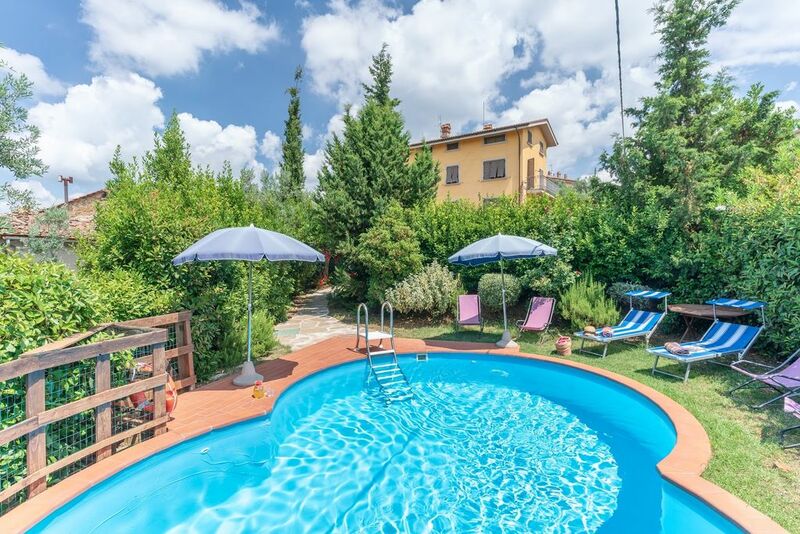 This hospitality facility is in a small, ancient hamlet in the hills of the countryside which surrounds the birthplace of the great Leonardo da Vinci. Olive groves, vineyards and houses scattered in the countryside are all that can be seen around it. On clear days the view sweeps from the mountains of the Apennines right to the coast. Walking along the small streets and in the countryside is a bit like putting oneself in Leonardo’s shoes because here is where he got his inspiration to construct his timeless works from. In the garden, the guests can use a bean-shaped, illuminated swimming pool (4x7, 1.4m deep)(01/05-30/09 open from 8am to 9pm) with a playing area for children, built-in barbeque as well as a terrace furnished for outdoor meals. The guests can also use a laundry room (washing machine, iron board and iron) in the basement of the house. The house has central heating, air conditioning in the bedrooms, wi-fi Internet connection, insect screens at the windows, mountain bike. A tourist guide, food-and-wine tours, a maid, a chef and a babysitter are all available upon request and to be paid for on location. Car park on the property. ACCOMMODATION: (180 m2) Gr. Fl. : living/dining room with fireplace and a kitchen divided from the living room with an arch (oven, freezer, dishwasher, microwave). 1st fl. : 2 double bedrooms, 1 bathroom with bath. Attic: 1 bedroom with twin beds, 1 double bedroom, 1 bathroom with shower. Basement (only reached from outside): laundry room, 1 bathroom with shower. There is a TV in each bedroom.LOCATION: 3 km Vinci (all kinds of shops), 16 km Empoli (train station), 43 km Lucca, 47 km Florence, 65 km Pisa, 75 km the beaches of Versilia, 65 km Barberino di Mugello outlet.